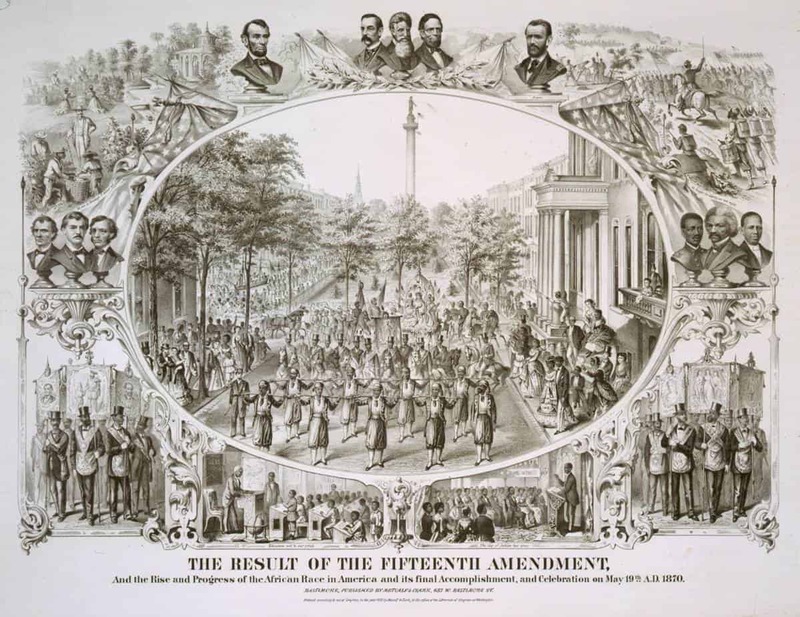 One of several large commemorative prints marking the enactment of the 15th Amendment on March 30, 1870. This print, like the second print of the same name and “The 15th Amendment. Celebrated May 19th 1870” (both in the image collection), shows multiple scenes that represent the past, present, and future of the African American community. The central vignette pictures the parade held in Baltimore on May 19th that celebrated the amendment’s passing. At the head of the parade are a small troop of black Zouaves, holding rifles across their shoulders, followed by several men on horseback wearing top hats and sashes, several floats, and more soldiers. Onlookers, including many African American men and women, watch the parade pass. Around this central image are scenes of past injustice (plantation scene in upper left corner) and past accomplishments (African American soldiers fighting for the Union), as well as present and future centers of African American life (a black schoolroom with the words “Education will be our pride,” and a black preacher before his congregation, with the words, “The day of Jubilee has come”). Positioned around the central scene are busts of white and black politicians, abolitionists, and civil rights fighters. In the lower corners stand two parade groups of black men wearing Masonic sashes and aprons. They carry banners decorated with allegorical figures as well as the portraits of Lincoln, Grant, and Swiss patriot William Tell and his son.